Merlin Hagemann had no idea back in 1971 that a simple class project would lead to this. As a senior at Byron High School, he joined a program that allowed students to job-shadow local professionals. For Hagemann, owner of Merlin’s Flowers and The Other Side, 300 Mix St., Oregon, Ill., the job-shadowing experience was one of those happy accidents that led to his life’s work. 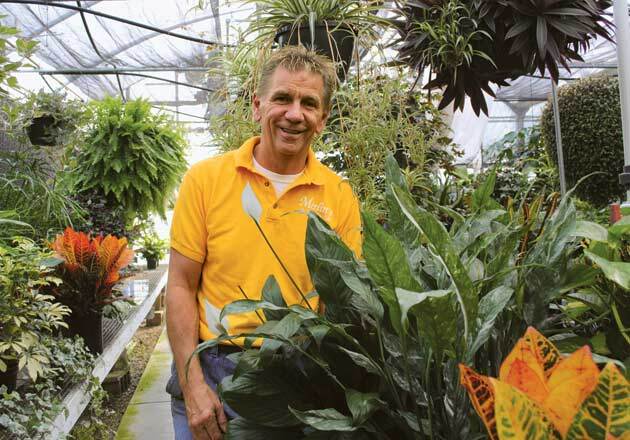 And after nearly four decades of running the greenhouse, gift shop and floral business, the 57-year-old still finds something magical about it, particularly in the relationships he has formed with customers. The store offers plants, cut flowers and a wide variety of gift items. Its gift gallery is filled with antique furniture, gourmet foods, one-of-a-kind accessories and other treasures, such as silk flower arrangements for interior decor. Hagemann got his start here by renting out the gift shop from Foelske, just a few years after graduating from high school. He later subcontracted the florist’s funeral jobs, and then bought the entire business in 1976. It was a natural fit. In fact, he blended in so well with the family business that he was often mistaken as one of Foelske’s sons. 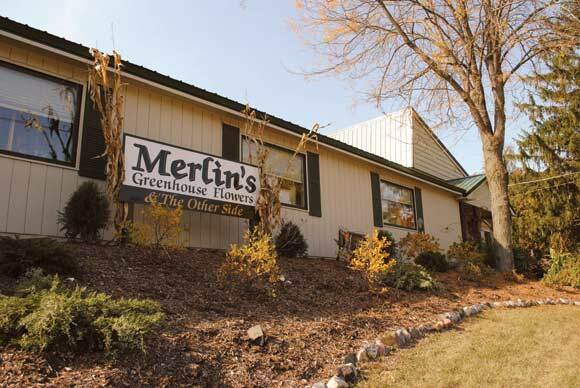 Nearly 40 years later, Merlin’s is still a family business. Hagemann owns and operates the business with wife Cindy. Their three grown children pitch in when available, and have been doing so “since they could see over the counter.” Son Tyler is stepping into his father’s shoes, and will take over the greenhouse when he finishes college. The 11,000-square-foot greenhouse is filled with plants year-round. Bright, hardy mums and still-green poinsettias fill the rows in fall, and an entire corner showcases colorful, warm-weather plants. During the winter, the greenhouse takes a back seat, as the gift shop fills with eager Christmas shoppers. First-time visitors may notice what looks like two separate stores – Merlin’s, and a smaller boutique across the street. The smaller shop is also Merlin’s, but is better known as The Other Side. Constructed in 2004, the gift shop got its name for a very practical reason: it’s on the other side of the street from the main building. 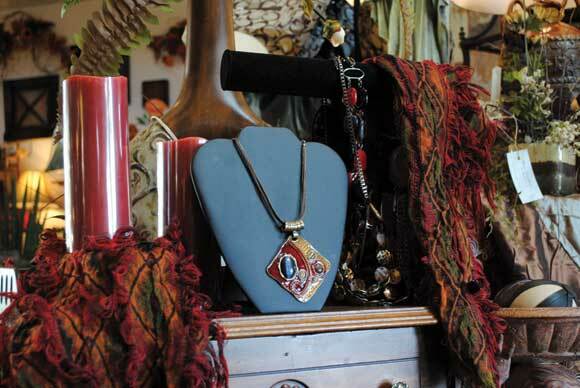 The boutique is filled with unique gifts such as jewelry, Willow Tree figurines, purses and gourmet foods. Custom coffee samples are available to shoppers, an indication of the hospitality which sets the shop apart. The sense of family here extends from blood relatives to the store’s 13 employees and out to the community. Hagemann feels a special connection with generations of loyal shoppers. Staff members go out of their way to provide exactly what is wanted in an arrangement, for example, rather than providing only the cut-and-paste variety. For a recent funeral, they worked the baseball cap of a Chicago Cubs fan into a flower display. Another time, they added lottery tickets into an arrangement for an avid lotto player. Customers really enjoy those small touches, says Hagemann, who’s often found chatting with customers, swapping stories. The family’s attachment to the Oregon area became obvious in the mid ’90s, when Merlin briefly stepped away from the business. Looking to pursue other interests, he sold the store and tried to avoid overshadowing the new owners. Yet time and again, loyal customers told him how much they missed his business. He returned, after a few years, to rescue the business. Spreading the word about his return meant focusing on the basics. That kind of attention to detail and customer service gives the business an important edge on other retailers selling gifts and flowers, says Cindy. So does innovation. Hagemann is never satisfied with the status quo and believes there’s always room to improve, whether that means finding faster production methods or attending conferences to find new products, technologies and ideas. Hagemann has found that new ideas can save him time and improve his bottom line. Take, for example, the corsage. Each one takes almost an hour to construct, as a designer adds wire to the main flower and then continuously wraps each new flower and leaf with tape. At a recent conference, Hagemann learned a quicker, easier process that involves gluing everything together, then taping it. When Homecoming season came this fall, his staff cut in half the amount of time it took to make the corsages and boutonnieres. Staff members notice the improvements, and enjoy making their own contributions to success. 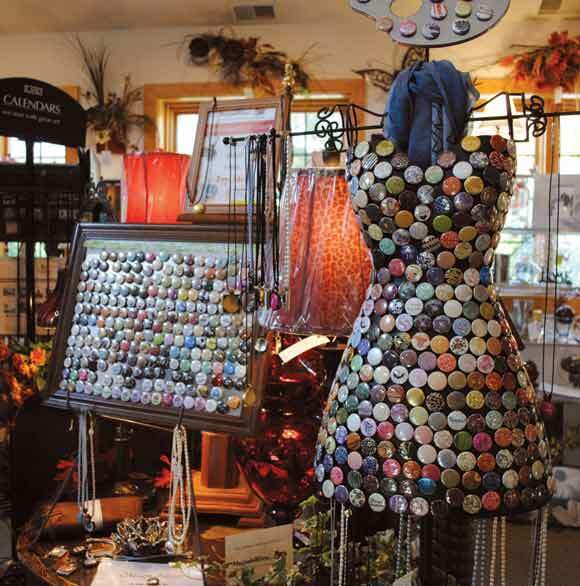 Carol Dees coordinates store displays, advises wedding clients and wears many other hats. She’s been part of the staff for nearly 15 years, and finds that the family atmosphere draws everyone together. Hagemann takes time to share with the community, too. Three times a year, both stores host an open house. Visitors – mostly loyal customers – can see the newest gifts and sample the season’s foods, prepared by a staff member who’s also a certified caterer. Customers find deals during the rest of the year, too, such as the Facebook special of the day, in which a given word or phrase found online earns discounts when mentioned in the store. Nearly 40 years after his job-shadowing experience led him to this store, Hagemann still finds joy in his work and doesn’t plan to stop doing it anytime soon. He’s built a loyal following, and after so many years of sharing life’s special moments, he and his customers and employees are practically family, anyway. He believes “success” is defined by the friendships and family-friendliness he shares with customers. This entry was posted on Tuesday, December 14th, 2010 at 11:58 am	and is filed under Northwest Business Magazine. You can follow any responses to this entry through the RSS 2.0 feed. Both comments and pings are currently closed.